If you’re looking for an electrified vehicle for family duty, the Nissan Leaf isn't the new kid on the block anymore and it's far from the only choice. The 2017 Ford C-Max Energi isn’t an all-electric EV like the Leaf, but as it's a plug-in hybrid it can be run on electric-only. So, let's see how they shape up by comparing the 2017 Ford C-Max Energi vs 2017 Nissan Leaf in a head-to-head Ford vs Nissan shootout. 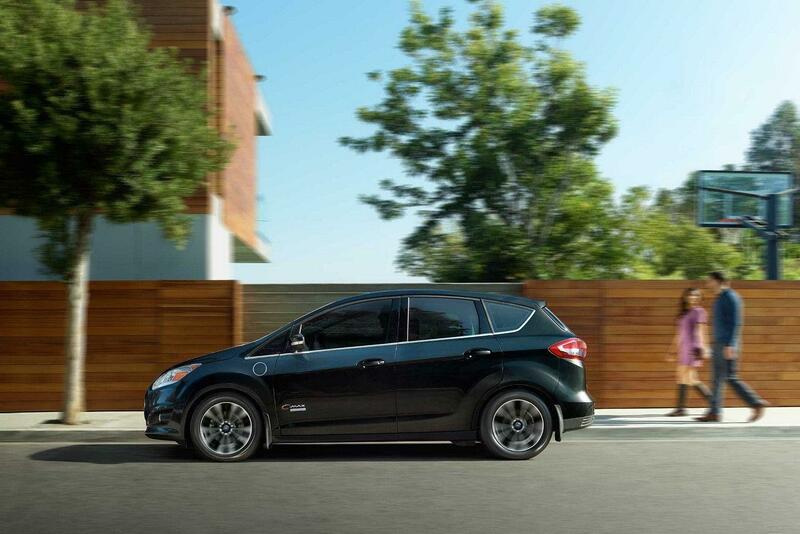 The C-Max utilizes a hybrid gas/electric powertrain comprising of a 2.0-liter inline-four gas engine and two electric motors for a 195 horsepower combined power rating. The C-Max Energi has a 7.6 kWh battery that's considerably larger than the 1.4 kWh battery in the standard C-Max Hybrid, so it offers up to 20 miles of all-electric driving range on a full charge. The Nissan Leaf doesn’t have a gas engine to fall back on when the battery runs out, which is why it has a 107 mile range on a full charge. The C-Max can get from 0-60 mph in around eight seconds, so the fact the Leaf takes around 10 seconds for the same task helps to make this a first win for the Ford in our C-Max Energi vs Leaf comparison. It's not unfair to say the C-Max Energi is no exotic sports car in terms of how it looks, but this designed-for-Europe family car is smart, sensible and contemporary looking. It's part hatchback, part tall wagon and there's even a hint of minivan in there, which reflects its overt family practicality. The Nissan Leaf looks, well, like a Nissan Leaf. Anyone who knows anything about cars will recognize it as an EV straight away, which is fine if you're happy to flaunt your eco-friendly credentials. Otherwise, the Leaf is a funny looking, bug-eyed compact that's only going to appeal to a relatively small audience, and that's why this is another round going to the Ford. Until you see it in the flesh, the C-Max Energi probably looks bigger than it really is. In fact, at 173.6 inches long it's actually 1.4 inches shorter than the Nissan Leaf. However, there's an impressive 99.7 cu.-ft. of passenger volume in the Ford and just 92.4 cu.-ft. in the Nissan. This translates to more room for passengers by almost every measure, especially for legroom in the rear seats as the C-Max has 36.5 inches to just 33.3 inches in the Leaf. It's got to be another win for the C-Max Energi then. There's no getting away from the fact the C-Max Energi is one of the most fuel-efficient cars Ford currently offers, even though it has had to reduce the figures in recent years a little. The EPA rates the Ford at 39 mpg combined when operating in the hybrid mode, and it gets an overall rating of 95 MPGe when all-electric capability is taken into consideration. Obviously there's no mpg rating for the all-electric Leaf EV, but the combined MPGe figure of 112 is quite a bit better than the C-Max, so the Nissan finally gets a win. If you want all-electric driving and you can live with the inherent restrictions, the Leaf's improved range of 107 miles on a single charge will be welcome news that makes it a little more useable than it was before. But if you need more flexibility, practicality and interior space in your family vehicle, you have to go for the versatility of the C-Max Energi every time. For more details about the 2017 Ford C-Max Energi and to arrange a test drive, don’t hesitate to get in touch with us here at Southern California Ford Dealers.